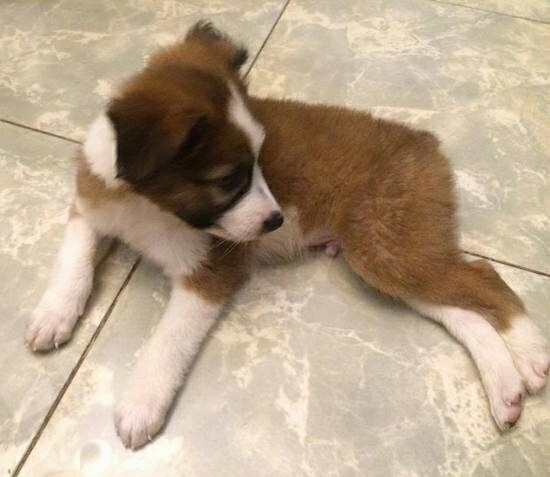 Bonbon the St. Bernard / Border Collie mix as a puppy at 2 months old—"BonBon is a St. Bernard/Border Collie crossbreed. He is almost 2 months old and weighs well over 5 lbs (2kg) in this picture. The mix of a Bernard and Border Collie is amazing and our dog is VERY fluffy, surprisingly. His mother is a purebred St. Bernard and his father is a purebred Border Collie. The fur of the Saint Bernard together with the Border Collie's long, smooth hair created a very fluffy, cotton candy-like coat that is very unique." The Border Collie Bernard is not a purebred dog. It is a cross between the Border Collie and the Saint Bernard. The best way to determine the temperament of a mixed breed is to look up all breeds in the cross and know you can get any combination of any of the characteristics found in either breed. Not all of these designer hybrid dogs being bred are 50% purebred to 50% purebred. It is very common for breeders to breed multi-generation crosses. 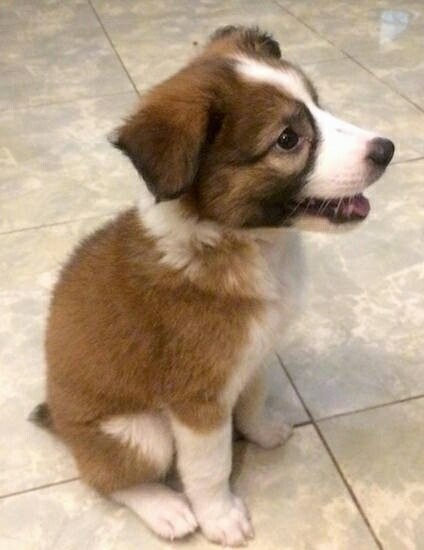 Bonbon the St. Bernard / Border Collie mix as a puppy at 2 months old—"When he was 7 weeks old he already knew how to sit. He likes liver spread more than anything. He is slightly underweight because of his food of preference. Despite that, he still looks fat because of his VERY FLUFFY COAT. 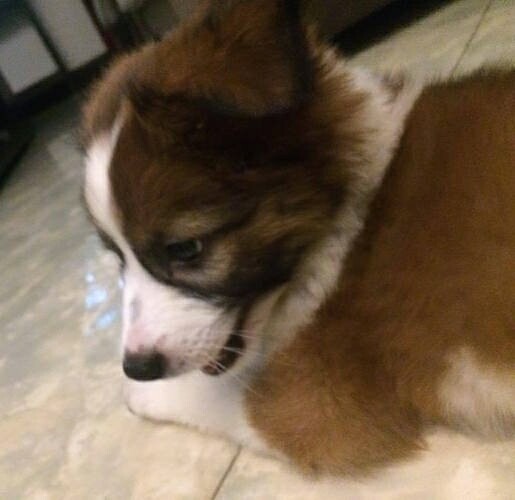 As of now, we finally managed to make him eat more food! 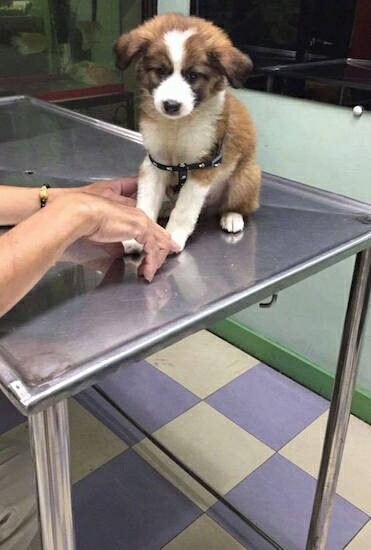 Bonbon the St. Bernard / Border Collie mix as a puppy at 2 months old—"We will be able to walk him outside as soon as his vet gives him all of his shots. Our vet said, he predicts that Bonbon would be GIGANTIC and that's what we want, a very fluffy giant dog, who is relaxed like a Bernard, but fast like a Collie. 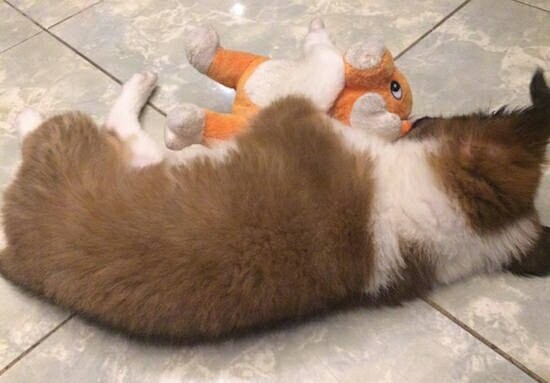 Bonbon the St. Bernard / Border Collie mix as a puppy at 2 months old—"Bonbon prefers my girlfriend's stuffed toy as his chew toy over his dog toys." Bonbon the St. Bernard / Border Collie mix as a puppy at 2 months old chewing on a dog bone—"Bonbon got his mother's calmness and his father's agility, which we think is amazing. We never knew he would be this beautiful and we got ourselves a perfect family dog."